Today, we had a chat with Beverly Wee, who shared her experiences since joining the Writing From the Heart workshop in 2015 and her journey in completing Of What Could Be. My journey as a playwright has been a tremendous experience I treasure and one that’s very close to my heart. 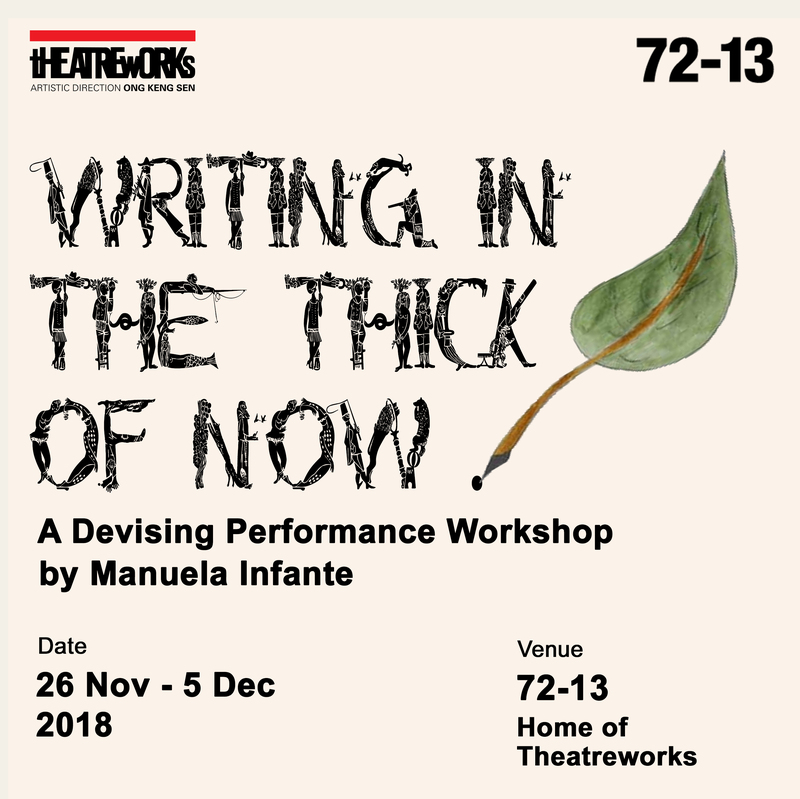 I’ve wanted to do this for a long time and it is a joy to actualize it, take my first step as a playwright and for this play to come to fruition. I’ve been writing for some time; this was a fantastic opportunity to develop my play and have this dramatised reading as part of the journey towards having it staged. Throughout this journey, I’ve found a safe and welcoming space (in the workshop) to develop creatively, found new friends and a wonderful mentor in Tony Perez. I’ve been fortunate to have many incredible, supportive teachers in the creative arts whom I’ve learned a lot from and have shaped me as a person and artist. They are always with me in some way, and from time to time I hear their words when I’m working on a piece. Through this program I found another mentor, and you can never have too many that you trust and who will encourage and guide you on your journey! I’m thrilled to be on this journey with TheatreWorks whose creative direction I’ve long admired and with an amazing team who has been incredibly supportive. So, thank you! As with any writing process, there are moments of creativity, writer’s block, joy, angst. It’s not a linear process. The beginning is a lot of fun when you draw on your creativity to create the story and characters. Then there were times I’d come to a point wondering for days wondering how to push it forward when an idea would come to me. Those were the high moments. As I developed the play, there was a lot of angst as well. As with everyone who wants to do good work, haunting questions are “Is this enough?” “Can this be better?”. There were hours it would keep playing in my mind as I wondered how to improve and edit it. I read it so much at certain times in the editing process I had to take a break because I was too familiar with the material. I was glad to get feedback and guidance along the way. In the editing process, I had to grapple with what to take out, what’s too much, and what to add in. Editing it, tightening it for structure, choosing what to take out and sharpening it was the most difficult part. The other part that I’m still learning to balance is how much and what specific feedback to take in when editing my play versus sticking to my original version. A play is very much alive and it’s an ongoing process as it continues to be shaped and finalized. As part of the process in getting it staged, I’m looking forward to being mentored further to sharpen it and maximize the impact, story and characters in the staged play. I’d like the audience to watch and listen and take away aspects that call out to them and the way it affects them. Broadly, it’s about the tension between what we desire versus the pressure to do what it safe and practical in life. It’s told through a protagonist’s relationships – one encouraging her to pursue her passion and another who believes in a checklist that defines success. She discovers what she wants in life and what it means to choose to be with someone. In living a full life, how do you navigate the choices to turn your dreams into reality? Taking a step back, do you even remember what your dreams are, do you know what you want or has life become a monotonous routine? Do you leave your salaried job to pursue a start-up you’ve always wanted to build? If there’s someone you’ve always loved, would you grab a second chance to be together or remain in the safe status quo? What if you’ve always wanted to live in another country, do you leave your comfortable confines to explore the world? And when you do follow your heart, is it as perfect as you imagine it to be for all you sacrificed? What do you take away when things get tough, and realize who stands by you and the ones who do nothing? The list goes on. The choices and push and pull factors will be different for each of us as will the outcome. You want to do something, but there’s risk involved. Do you do it? Does it change your life for the better? Everyone grapples with these choices in their own way, however big or small. It’s a universal, relatable experience we face when we choose to do something different. It’s th challenge and difficulties of breaking away from what people around you expect from you. It’s not a smooth passae though the journey brings us insight into what’s important to us and the people who really show up for us. It has been an amazing, unexpected journey and the beginning of more to come! The workshop was a nurturing, safe environment to grow creatively and opened my mind to so many other aspects in the writing process. I value the time and mentorship with Tony. His feedback and guidance helped me develop the play and he’ll say it as it is. He guided me when I had questions, got stuck, and through the edits. He has great insight and in fact, very early in the process, he saw the overarching theme of my play. It took me longer to feel it and for it to sink in. Tony is a valuable mentor beyond just playwriting and I always appreciate time with him to hear his insights on plays, life and beyond. I’m thrilled to have this script presented in a dramatized reading! I’m also nervous about how the play is received, it’s all part of the process and I’m excited about future opportunities to come. I’m looking forward to writing more plays, bringing to life the experiences and voices of others, stories that bring people together through laughter and tears. Theatre has always been a source of joy and big part of my life. Theatre brings growth and discovery, exposing us to people, worlds and circumstances we would not encounter. Making us think about our attitudes towards others and issues around us, developing compassion and perhaps even driving us towards action to make a difference. It’s also a natural way to bring people and the broader community together. Whether it’s bringing an evening of laughter or richness to our lives through theatre, that’s the impact I look to achieve in time. The workshop encouraged me to dig deeper into my feelings and use it in my work. It gave me permission to draw from my feelings and experiences and use my observations in my writing. It made me write from a deeper level beyond fussing about the words and structure and in that way helped me to write freely. It also gave me tools to shape and develop fuller characters. Writing is a process and continues to evolve and grow as we ourselves grow. I’ve achieved and benefitted much more than I imagined from the workshop! I’ve been writing for awhile and love it, I attended the workshop to pick up additional skills and tips to improve my writing. It was that simple. I got so much more from it – in addition to writing skills, it released my creativity, led me to reflect through self-discovery, motivated me to complete the play, brought a teacher/mentor and wonderful friends into my life. Being in the workshop brought me so much joy and helped me achieve one of my dreams! Be open to things, be willing to explore. In a way, it’s about self-discovery. More broadly, if there’s something you are passionate about, take every step to learn more and every opportunity to do it. You can’t predict how one thing leads to another. Just do what you love! I hope you’ll all truly enjoy the workshop, take away a lot from it, bask in the safe environment, form new friendships and achieve something you want! If you’re keen on saving yourself a seat to hear the reading of Beverly Wee’s Of What Could Be, do register at our Eventbrite page today!